Finding the volume of a triangular prism isn't so bad, especially if you already know the length and height of the base and the height of the prism. In this tutorial, you'll see how to use that information and the formula for the volume of a triangular prism to get the answer. Take a look! If you want to find the volume of a triangular pyramid, you'll need to know the length and height of the base and the height of the pyramid. 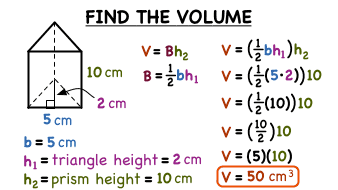 Once you have those values, you can plug them into the formula for the volume of a triangular pyramid and simplify. Check out this tutorial to see this process!